Often conspicuous as it perches upright on a tree, post, or rock, watching for food, this bird makes little attempt to conceal itself from potential enemies. It sometimes harries passing birds of prey with aggressive mock attacks. Its name refers to the tuft <1 feathers that springs from its forehead. The species often hunts in open woodland, where it watches vigilantly from a perch, then darts out to intercept a passing insect in midair. The long, outward-curving, forked tail provides great agility in the air. and the bird frequently twists and tumbles in pursuit of its prey, finally snatching it up in a short, stout bill that is slightly hooked to ensure a grip on the victim. The Crested Drongo also frequents more open grassland, where it hunts for insects that have been disturbed by grazing cattle, which it uses as mobile perches. 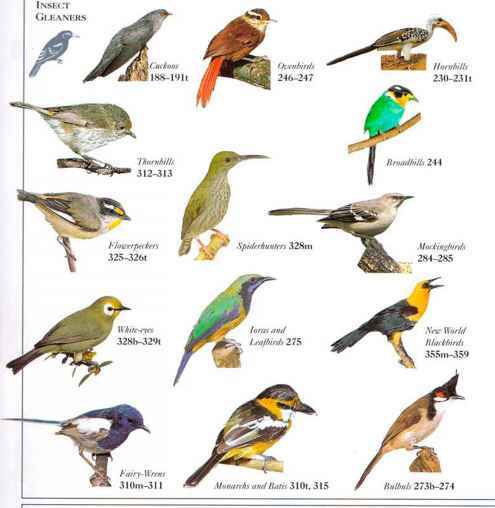 The bird also benefits from brush or grass fires, picking off insects as they escape from the heat. Crested Drongos hunt alone or in pairs, uttering twanging, metallic call notes. • NEST A light cup nest of interwoven plant fibers, suspended between two twigs forming a horizontal fork at the end of a branch in a tree. • DISTRIBUTION Madagascar and Comoro Islands (northwest of Madagascar).